Buttermilk Fried Chicken, the highly anticipated fast-casual and take-out restaurant from chef/restaurateur Ryan Adams, is open for business in Old Towne Orange. The cozy space specializes in Adams’ wildly popular fried chicken, which he serves up at his Laguna Beach restaurant Three Seventy Common Kitchen + Drink one Sunday a month. The chicken is accompanied by downhome sides such as mashed potatoes with gravy, mac & cheese or tots. The venue also features sandwiches, salads and desserts. Lunch & Dinner daily. Buttermilk Fried Chicken, 238 W. Chapman Ave., Ste. 100, Orange, CA 92866, 714-941-9124. The Blind Pig Kitchen + Bar is opening its second location in Orange County. The new outpost of the hip gastropub and craft cocktail bar, whose original venue is situated on the edge of OC in Rancho Santa Margarita, is slated to drop in Yorba Linda in late fall of 2018. The debut will coincide with the launch of Yorba Linda Town Center, the retail center it will call home. Guests can expect to peruse an eclectic menu of seasonal contemporary fare such as wild boar meatballs with Japanese curry or grilled octopus, along with drinks composed with fresh ingredients and house-made syrups. The Japanese noodle house Marugame Udon is coming to South Coast Plaza. The venue, which has sister locations in Los Angeles and San Francisco, is slated to open in fall of 2018. The menu is built on a build-your-own-bowl concept where guests can select various kinds of broth, proteins and garnishes to pair with noodles made in-house from proprietary cooking equipment imported from Japan. Diners can also order house specialties such as the Nikutama Udon featuring sweet beef and hot spring egg. Marugame Udon, South Coast Plaza, 3333 Bristol St., Costa Mesa, CA 92626, no phone. Through Labor Day weekend, Grasslands Meat Market BBQ & Churrasco in Anaheim is offering a BBQ Box for purchase that includes meat and sides. 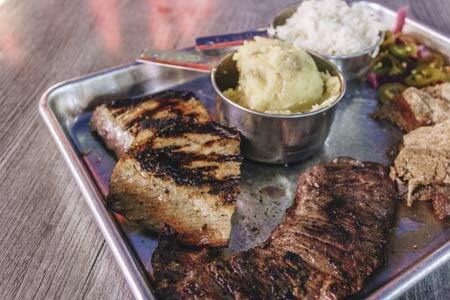 Designed to feed 6-8 people, the package ($99) features the restaurant's signature house meat, Picanha, along with two racks of St. Louis ribs, one rack of beef ribs, one whole chicken, mashed potatoes, black beans and a green salad with choice of dressing. Grasslands Meat Market BBQ & Churrasco, Anaheim GardenWalk, 400 W. Disney Wy., #199, Anaheim, CA 92802, 657-208-1133.